Vikram put Betal on his shoulders and Betal started a new story. A king wanted his son to marry the princess of the neighbouring kingdom. He asked him to disguise himself as a merchant and find out if she loved someone else. The prince went to the kingdom and stayed at an inn, but he fell ill. The innkeeper's beautiful daughter looked after him. The prince fell in love with her. But he wanted to fulfil his task. He told her, "The prince of the neighbouring kingdom is my friend. He wants to marry the princess. Ask her if she loves someone else." When the innkeeper's daughter asked the princess, she said that she didn't love anyone else. The girl came to know that the merchant was really the prince, she could have told him that the princess was in love with someone else, but she told him the truth. 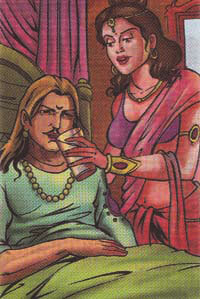 Betal said , "Vikram did the prince marry the girl?" Vikram replied, "Yes, because she had been honest." Betal said, "That is the right answer but you spoke, so here I go."